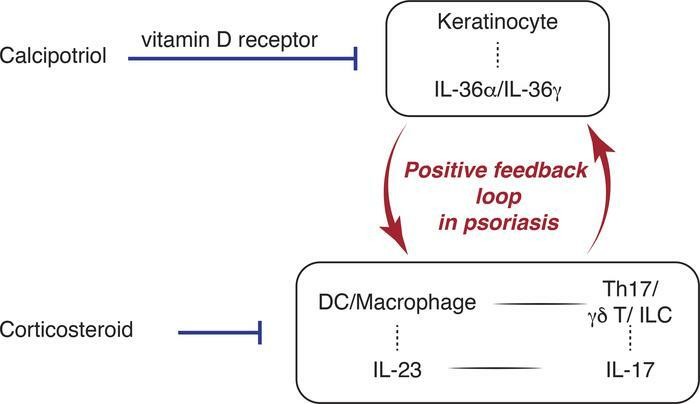 A schematic representation showing that the positive feedback loop of IL-36 and IL-23/IL-17 in psoriasis can be efficiently disrupted by calcipotriol and corticosteroid combination therapy for plaque psoriasis. Calcipotriol acts on keratinocytes to repress the expression of IL-36α/γ, an effect mediated through keratinocytic vitamin D receptor (VDR); on the other hand, corticosteroid acts on immune cells to suppress the IL-23/IL-17 axis (IL-23 produced by DC/macrophages and IL-17 produced by Th17 cells/γδ T cells/innate lymphoid cells [ILC]). By this means, the calcipotriol and corticosteroid combination disrupts efficiently the inflammatory loop, thus achieving a superior efficiency than either agent alone.